100 Blue, Red, Purple, and Green Dice. Standard Dimensions of 16mm cubed. 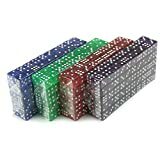 These dice have rounded corners and a vivid translucent coloring. Affordable bulk dice for any use.